Hudson Yards isn’t the only megaproject on Manhattan’s far west side. Developer Brookfield Properties has released a new set of renderings and a fly-through video of what the area will look like once its Manhattan West development is complete. Once complete, the seven-million-square-foot “neighborhood” will link Hudson Yards on the far west side with Penn Station’s renovated Moynihan Train Hall. Hemmed between Ninth and Tenth Avenues and 31st to 33rd Streets, Manhattan West will hold offices, retail, hotels, and residential units, with most of the buildings featuring sleek glass facades. ﻿ REX’s recent retrofit of 5 Manhattan West; the rising 69 stories of Skidmore, Owings & Merrill’s (SOM) One Manhattan West office tower; SLCE’s recently completed The Eugene, a 62-story residential tower and the tallest of its type in Midtown Manhattan; SOM’s Two Manhattan West, a 59-story office tower which recently filed DOB permits and the 13-story “The Loft” are all on track to finish construction by either 2019 or 2020. Fewer details have been released about the more mysterious Four Manhattan West, which will be a 30-story boutique hotel with condo units. A 60,000-square-foot public plaza designed by James Corner Field Operations and 200,000 square feet of ground floor shops and restaurants will round out the public amenities. Now, Brookfield has released a flythrough of the project, starting at a revitalized Empire Station (the forthcoming rebrand of the new Penn Station complex) with stops along each of the campus’s towers. Watch the video below: Brookfield has also created a VR walkthrough of the entire development, including interior views from each of the office towers, as well as street-level shots. Construction on the $1.6 billion Moynihan Train Hall is ongoing, and it may be a number of years before the area comes into its own. That doesn’t seem to be a hurdle for Amazon (who are already renting space in 5 Manhattan West), and reps from the tech giant will soon visit New York to scout out prospective HQ2 office space on the far west side. 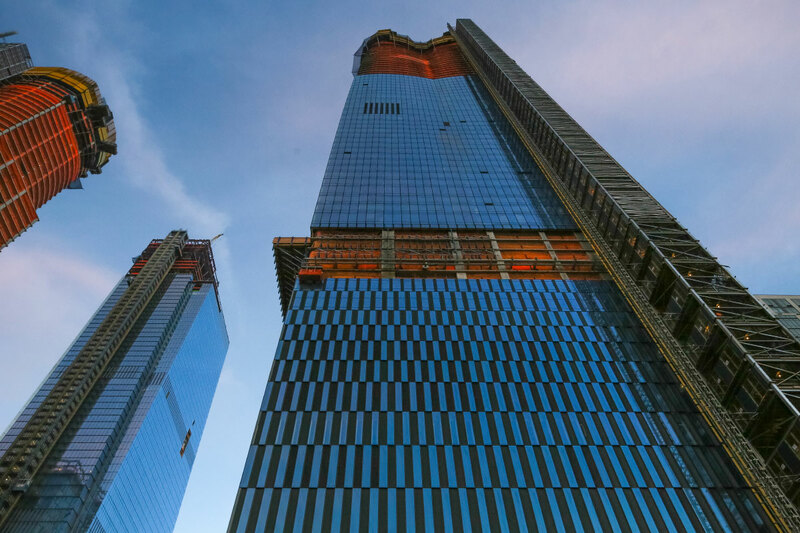 Spanish architect Santiago Calatrava and Los-Angeles-based Frank Gehry have been chosen to design an undetermined number of residential towers for phase II of Manhattan’s Hudson Yards megaproject, reports the Wall Street Journal. According to “a person familiar with the matter,” the two sometimes-controversial architects were among a crop of designers chosen by the project’s co-developers, Related Companies and Oxford Properties Group. As the first phase of Hudson Yards, development on the eastern half of the 28-acre site, has been racing towards the 2019 finish line, Related and Oxford have begun looking ahead to the project’s residential western portion. 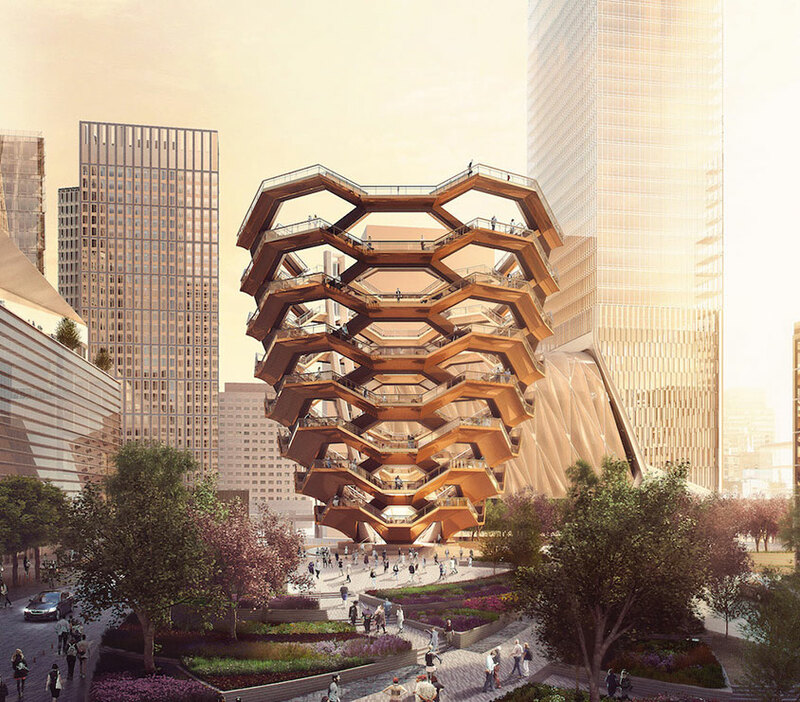 Phase one saw the rise of Thomas Heatherwick’s pinecone-shaped Vessel, the eventual completion of four surrounding office buildings, a subway extension on the 7 line, and the High Line-straddling cultural Shed. The second phase will see the rise of 4 million square feet of residential space spread out across seven towers, and another 2 million square feet of office space. The western portion of the site is bounded by the High Line to the west, and is where the elevated park dips to street level. Phase II will likely wrap up by 2024, the projected deadline for the entire project. Handing the reins over to Calatrava and Gehry is an interesting choice by Related and Oxford, as neither architect has realized many residential projects in New York City. While the billowing metal façade of 8 Spruce Street (aka New York by Gehry) is a familiar site on the skyline, Calatrava is most well known in New York for the soaring curves of the Oculus transportation hub. Gehry hasn't shied away from his tepid opinion of the High Line, saying "The High Line is a rusty rail bridge and they put some plants on it." 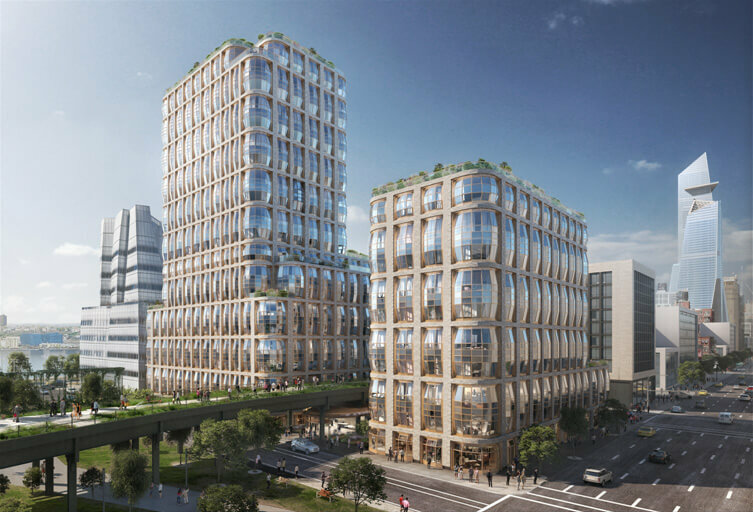 Whatever flair either architect brings to the project will also need to fit within the context of the Kohn Pedersen Fox-designed master plan for the site. AN has reached out to the relevant parties for confirmation and will update this post when more information becomes available. While Diller Scofidio + Renfro and Rockwell Group's The Shed might not open until spring 2019, its creative team will be hosting nearly two weeks of free arts events this May to build anticipation for the ribbon-cutting. 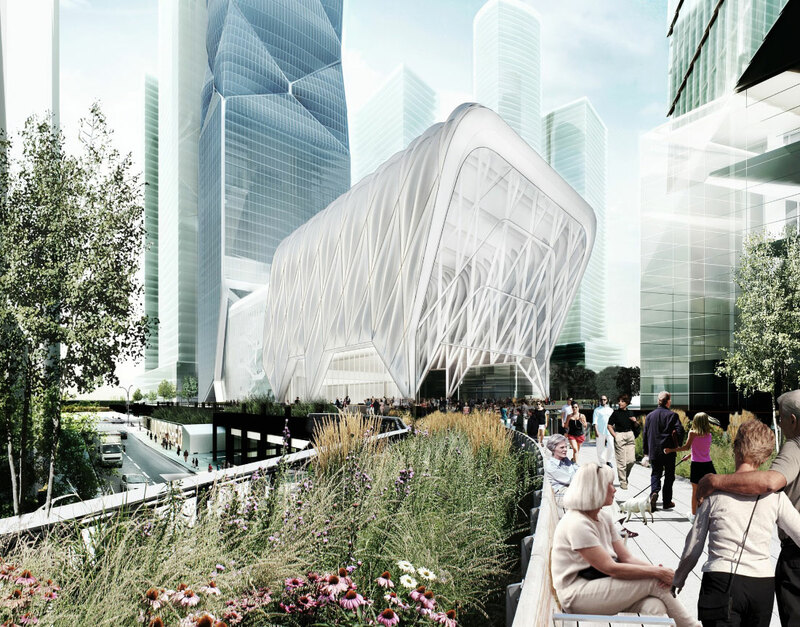 A Prelude to The Shed, held on a vacant lot at 10th Avenue and 30th Street in Manhattan, will feature live concerts, dance battles, art-focused political panels, and experimental classes that foreshadow offerings of the under-construction telescoping arts venue in Hudson Yards. From May 1 until May 13, visitors can experience Prelude in and around a reconfigured steel shed designed by architect Kunlé Adeyemi of NLÉ Works and artist Tino Sehgal. Prelude’s smaller shed will echo its larger counterpart by being fluid and transformable, with elements of the building able to move in response to the dancers within. “Using simple technologies, we made the structure so that it can be moved and transformed by people, enabling its participation in different formats of art, education, events, and public life,” said Adeyemi, in a press release. 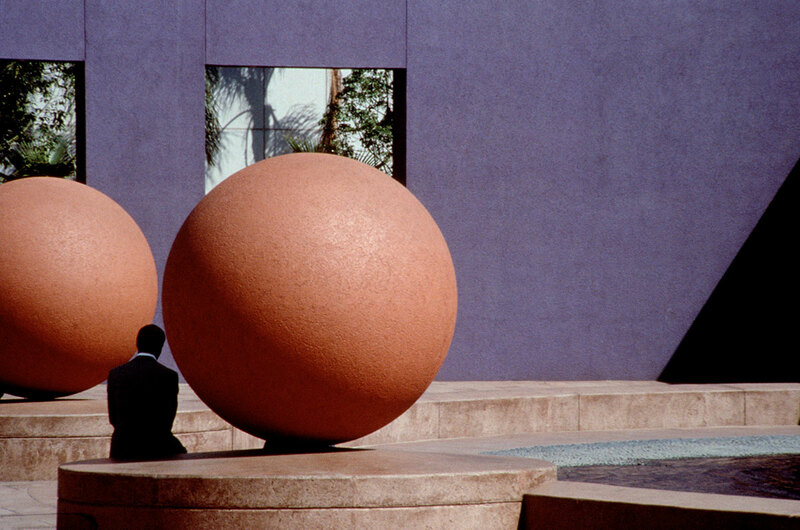 Each day of Prelude will bring a different program, though everything will be connected through Sehgal’s curation. Every morning, artist Asad Raza will lead experimental classes, based on his ongoing “Schema for a school” work, while panels on art’s role in social connectivity and the politics of ritualized gatherings will be hosted every other evening. Bolstering the series’ connection to The Shed, Prelude will host reproduced ephemera from architect Cedric Price’s Fun Palace, an unrealized moveable and multi-purpose venue that heavily influenced The Shed. Mobile exhibition carts stocked with artifacts from the Fun Palace will move around the temporary space to encourage public interaction. 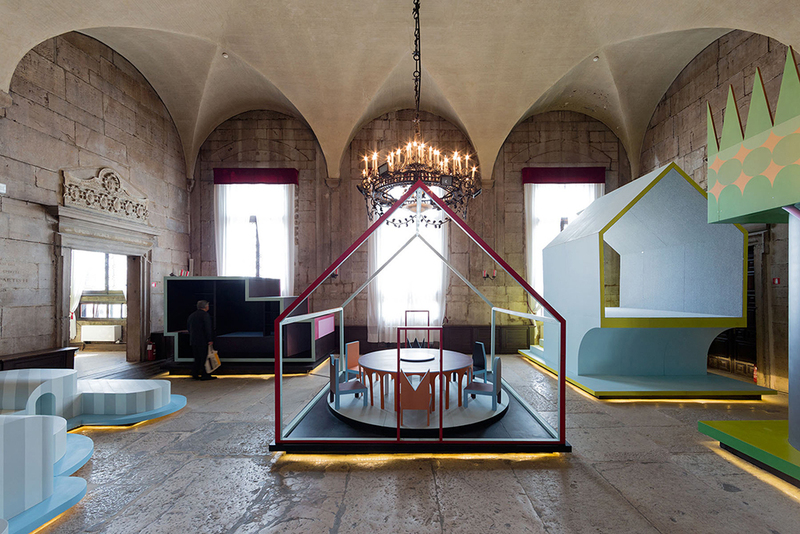 “Like The Fun Palace, Prelude is a hybridization of exhibition and performance, functionally structured to encourage open engagement with audiences and fresh, collaborative approaches from artists,” said Hans Ulrich Obrist, The Shed's artistic advisor. “It is emblematic of our own era in that it lends itself to the choreography of 21st-century time-based exhibitions.” A full schedule of Prelude’s programming can be found here, including a lineup for the concert series. Eager to combat a serious housing shortage in Brooklyn’s Borough Park neighborhood, State Senator Simcha Felder (D- Southern Brooklyn) announced Tuesday that the MTA would be opening a Request for Proposals (RFP) for developing a 3.8-acre stretch of rail bed that runs through the area. Decking over the site and building residences, similar to what’s happened in Hudson Yards and proposed for Sunnyside Yards, could bring thousands of units to an area of south Brooklyn that’s grown rapidly in recent years. 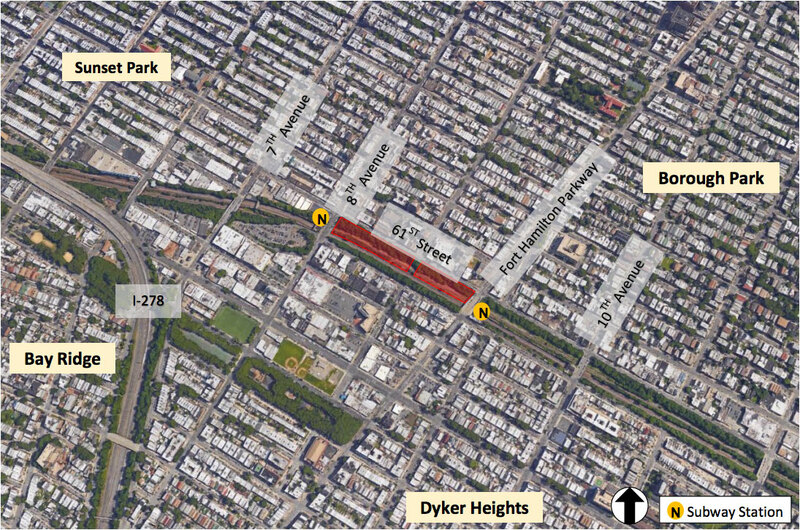 The Long Island Railroad (LIRR) Bay Ridge Branch section cuts from 61st Street between Fort Hamilton Parkway, and 8th Avenue, and is seldom used apart from the freight trains that might pass through once or twice a day. Looking to create a long-term revenue stream from the site, the MTA released their RFP for developing the site’s airspace, at least 22 feet over the rail bed, on Thursday, available here. Calling for private developers to apply, the RFP demands that teams would not only be responsible for the architectural aspect of the residential buildings on the site, both market-rate and affordable, but also retail and office space as well as parking lots. Additionally, any scheme has to leave the rail track in place, and engineering solutions must be included for decking over a gap that ranges from 82 -feet wide in some places to 118 feet in others. This is no easy feat, especially as utilities must also be supplied to the site and would presumably run through the decking; it’s no wonder that the MTA is requiring the entire project to be privately financed. 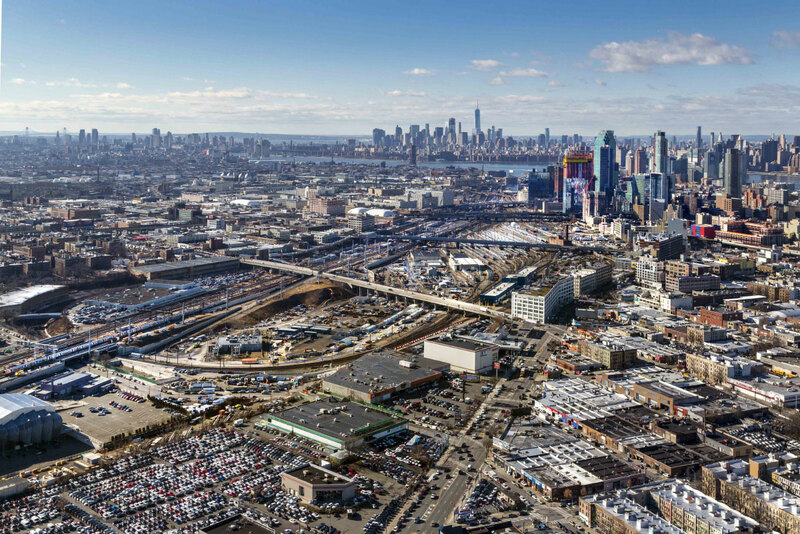 The cost of decking over the much larger, 180-acre Sunnyside Yards has been projected to cost up to $19 billion for similar reasons, though no cost estimates have been released for this stretch of the LIRR yet. The fight to build over this stretch of tracks has been going on for years, with local community groups only recently embracing the plan. Senator Felder stressed that any new construction would have to fit the character of the surrounding neighborhoods. “The vision is to create residential development that is consistent with the character of the neighborhood,” said Felder. “The location of this project presents a significant opportunity to create additional housing units on a gigantic parcel of land that covers a few city blocks.” Interested applicants have until April 27th, 2018, to submit a proposal. Will Chicago’s South Loop get its own Hudson Yards-scale development? Chicago may be set to build an entirely new waterfront neighborhood master-planned by Skidmore, Owings and Merrill and a state-of-the-art research center on the south side. Illinois governor Bruce Rauner, together with University of Illinois System president Timothy Killeen, announced the creation of a $1.2 billion public-private research partnership that will establish the Discovery Partners Institute (DPI), a scientific research center that will focus on three key areas: computing, health and wellness, and food and agriculture. The DPI is supported by The University of Illinois, The University of Chicago, and Northwestern University, and has been designed as a research incubator meant to keep Illinois students in the state and to help link the disparate university campuses around Chicago, while also serving to attract students to Related Midwest’s newly unveiled “The 78” development. Once completed, the innovation center would hold up to 1,800 students, and feature residential, commercial, recreational and cultural space. At 62 acres, The 78 will be built on a waterfront parcel that is an extension of the Chicago Loop and one of the city’s last undeveloped pieces of land. The name references the city’s 77-officially recognized neighborhoods, and Related hopes the project will be seen as a full, integrated neighborhood once it’s finished, similar to Hudson Yards in New York. Prospective residents and commuters won’t be lacking for transportation options either, as the CTA has Red, Orange, and Green Line stations located nearby, as well as a water taxi stop. Related has promised an as-of-yet unspecified amount of land to the DPI inside of The 78. The 78’s SOM-designed master plan envisions the new neighborhood as a continuation of Chicago’s central business district, and will bring residential, commercial, cultural and institutional projects, though 40 percent of the total land area will be green or public open space. A new half-mile long riverwalk will follow the entire length of The 78’s coastline and connect to already existing esplanades in adjacent neighborhoods. 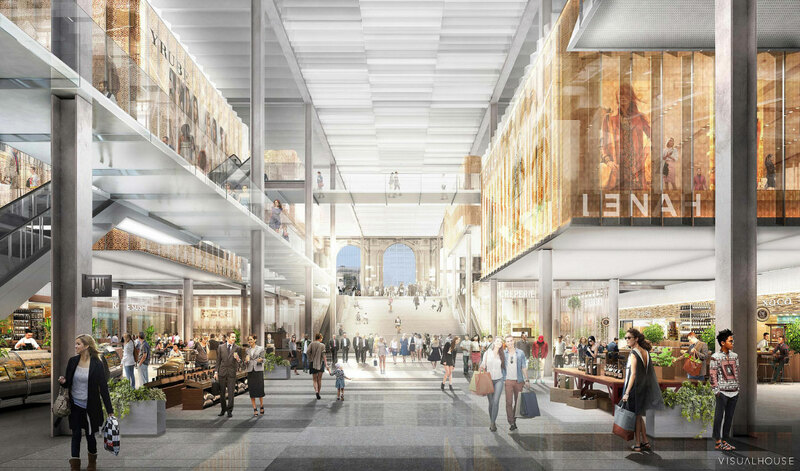 Other than SOM, a full suite of architecture studios have already signed on to contribute work to the massive ground-up project, including 3XN, Hollwich Kushner, and AS+GG. While The 78 and DPI have broad support from state and city-level politicians, as well as University of Illinois leaders, no public or private money has been raised for the project yet. Another make-or-break factor may be the result of Amazon’s HQ2 search, as Related is hoping The 78 will lure the tech company to set up shop in Chicago. With funding for the development currently uncertain, no timetables for either project have been released yet.